Late German goal sees two sides draw. Alexandre Lacazette scored twice for France tonight, as the Arsenal forward’s side drew 2-2 with Germany in their final international match of the year. Lacazette opened the scoring in the 33rd minute after being brilliantly set up by Man United winger Anthony Martial. Timo Werner then drew Germany level before Lacazette found the net again to put Les Blues 2-1 to the good with 20 minutes left to play. Germany then found a last-minute equaliser through Lars Stindl at the match finished all square between the two European powerhouses. 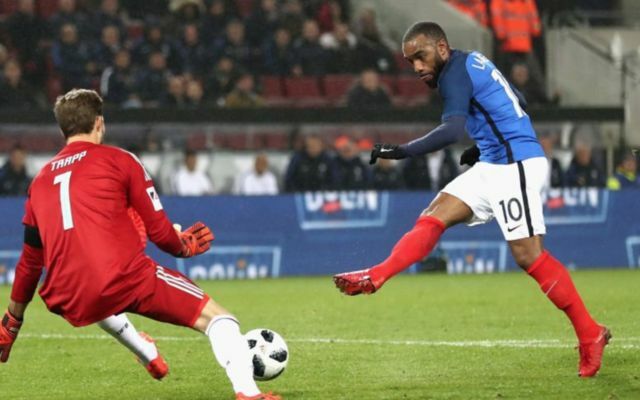 Gunners ace Lacazette will take the plaudits tonight, as the former Lyon forward scored both of France’s goal as they succumbed to a 2-2 draw with Joachim Low’s side. The player showed exactly what’s he’s capable of with his second goal, as his perfectly timed run and cool finish showed why Arsenal felt the need to fork out for the player over the summer. This tweet sums up just how good Lacazette was tonight, even if it is from a parody account! I must say Lacazette was absolutely outstanding for France tonight, with two exceptional goals in Germany. Did Eriksen score three in Ireland? I don’t know. Moments after a stunning bit of skill from Mbappé almost made it 1-0, Anthony Martial danced his way through to set up Lacazette to make it 1-0. The amount of talent on this French team is scary. Lacazette with a neat brace tonight. I can’t wait for the NLD. Nailed on to be on the bench so we can accommodate Alexis and Coquelin. Great game from Lacazette. Deserve that seat on the bench come Saturday ? Ozil dropping a 10/10 against France showing why he’s the best attacking midfielder in the world. Will probably go “missing” on Saturday but that’s what happens when you don’t build a team around your best players. Take note Arsene.